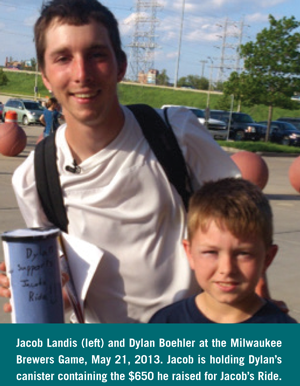 Cochlear implant recipient Dylan raised over $650 for Jacob’s Ride in just one week! Jacob and Dylan would like to challenge you to help raise funds for Jacob’s Ride. The biggest fundraiser for Dylan’s challenge will earn a trip for two to Miami to join Jacob for the ride finale on September 24th. Second place gets a children’s bicycle, and third place earns some selected Jacob’s Ride memorabilia! Jacob is riding over 10,000 miles this summer in a record heat wave to help people get cochlear implants. You can participate in the Dylan Challenge without even breaking a sweat! Register now at Jacob’s Ride! This entry was posted in News and tagged Dylan Challenge, Jacob's Ride by CochlearImplantHELP. Bookmark the permalink.